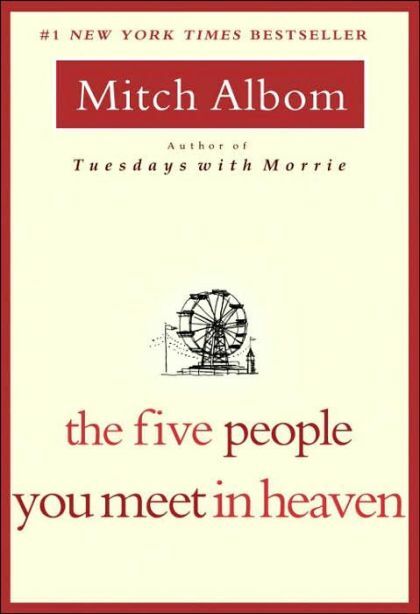 From the author of the phenomenal #1 New York Times bestseller Tuesdays with Morrie, a novel that explores the unexpected connections of our lives, and the idea that heaven is more than a place; it's an answer. Eddie is a wounded war veteran, an old man who has lived, in his mind, an uninspired life. His job is fixing rides at a seaside amusement park. On his 83rd birthday, a tragic accident kills him as he tries to save a little girl from a falling cart. He awakes in the afterlife, where he learns that heaven is not a destination. It's a place where your life is explained to you by five people, some of whom you knew, others who may have been strangers. One by one, from childhood to soldier to old age, Eddie's five people revisit their connections to him on earth, illuminating the mysteries of his "meaningless" life, and revealing the haunting secret behind the eternal question: "Why was I here?"